The big downside of touring with ‘support’ is that you don't get to work to your own timetable and getting ready in the morning can be a pain. 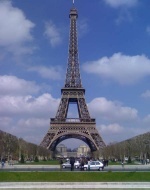 I didn't set off until gone eleven and, with the Paris traffic, it was midday by the time I got to the Eiffel tower. Getting out of Paris took longer than expected; I seemed to catch every traffic light going and the suburbs sprawl further than you imagine. I made a late change to the plan and took a more southerly route through the forest of Chemin. This proved a good choice, as it provided a nice long spell on car free roads in scenic woodland. The payback for this was spending the rest of the day on an eastern path battling a strong crosswind. With the late start and less than rapid progress, I was struggling to catch-up with myself all day and ended up calling it a day, when it got dark, 20k short of Troyes where I had been hoping to stop. Another unexpected issue was the lack of opportunity to replenish supplies along the way. Even though it was Monday, none of the shops in the villages along the way were open for business and, as the route was based on minor roads, there were no service stations where one might refuel either. Thus my only provisions for the day were the 2 litres of water, 2 apple tart type things and the 3 bananas liberated from the hotel breakfast that morning. Apart from the lack of food, constant wind and late start, the route was a very pleasant one and, Paris aside, almost traffic free. The profile seemed to indicate there had been some hills (though not on the 1500 metre scale being used for this tour), which was a surprise as, apart from a couple of short climbs into or out of some small villages, there were none that stuck in my mind.